This year, I've been spending a lot more time walking around Old Town. 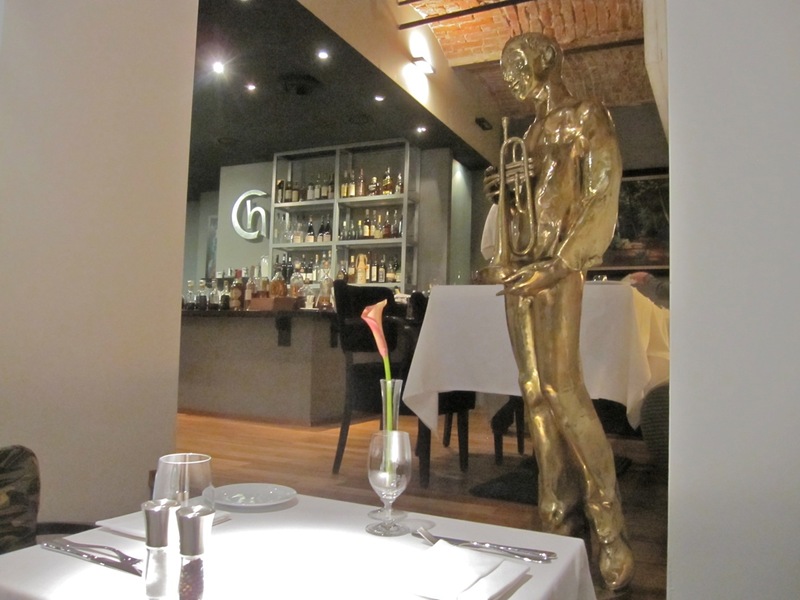 When I do, I never fail to take note of restaurants that have disappeared and those that have taken their place. This happened a few months ago when I saw that Cafe Wow, a place I had never tried, was gone. The restaurant was completely done over. 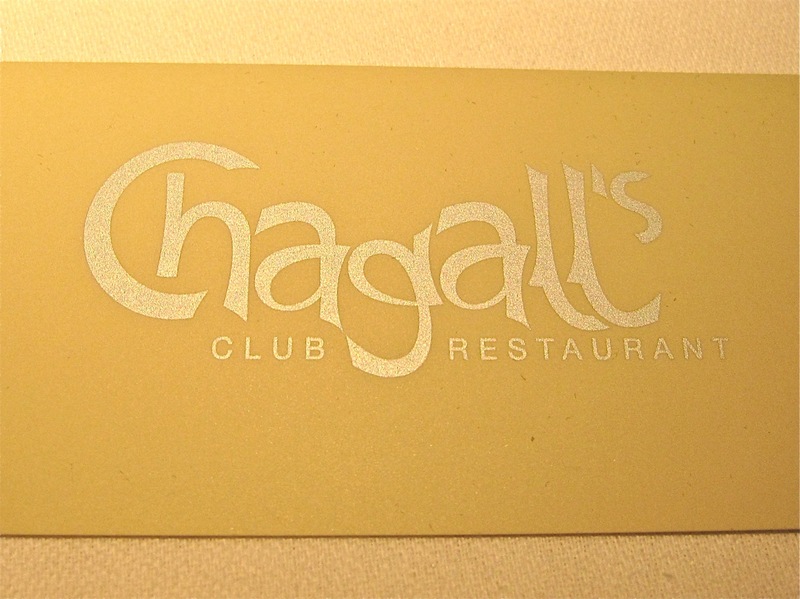 It is now called Chagall's Club Restaurant. The eatery opened in May 2010. According the website, it is under the guidance of Czech chef Petr Hajny, with a focus on seasonal pan-European cuisine. I checked out the menu and it looked quite sophisticated. It was puzzling that there was nothing written about it on the web. I decided I'd just have to be brave and be the first. 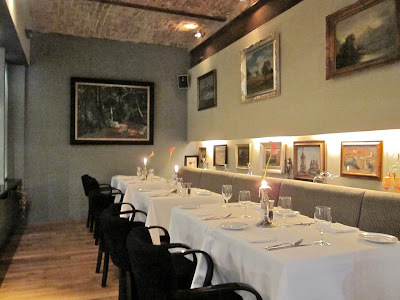 The restaurant is not far from Old Town Square. You can see the rear view of the Týn Church spires from its entrance on Kozi street. The modest-sized dining room has high ceilings, spot lighting, framed pictures on the walls, and overall, a casual, relaxed charm. Light techno-style music played softly on the sound system. There are a few tables in the back with a more cozy feeling. I had my choice of seats in the front. There were only two other tables occupied. The whole restaurant is non-smoking. The waiter brought a bread basket. 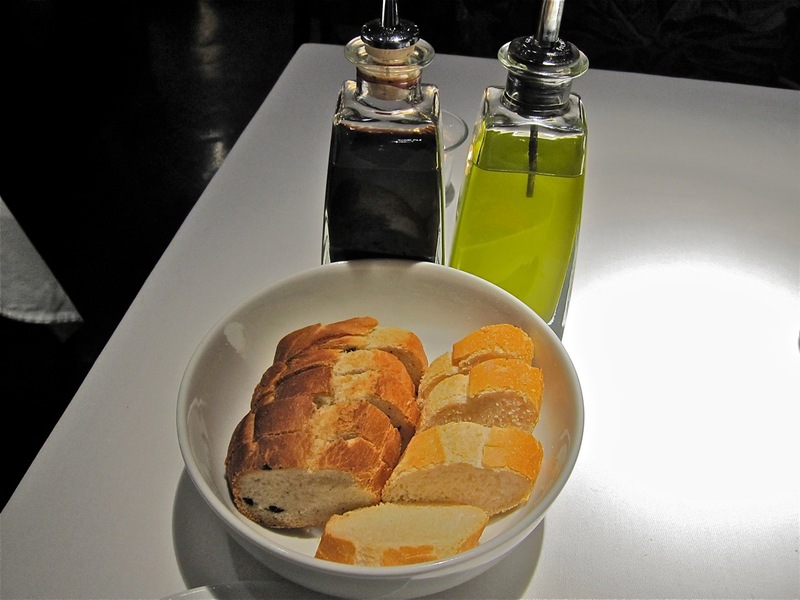 It contained fresh, light baguette slices and slightly denser, sliced olive bread. There was quality olive oil and balsamic vinegar. 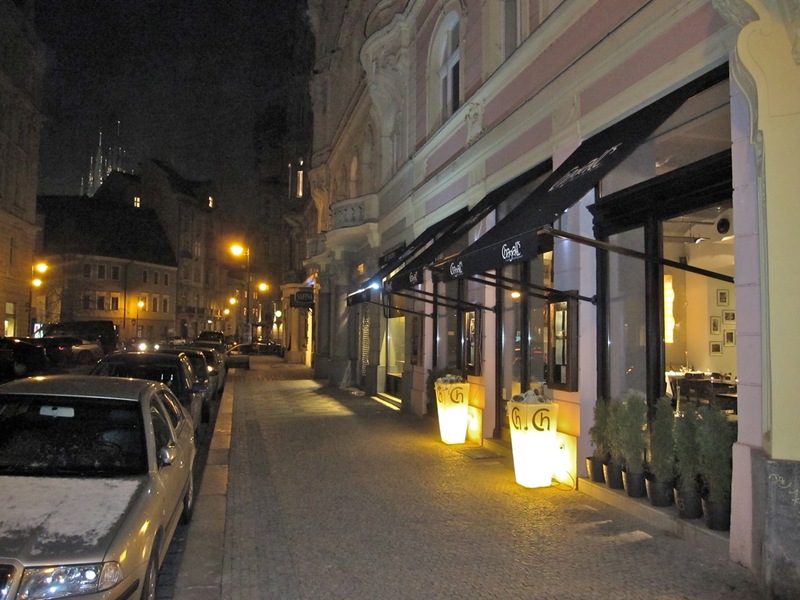 I ordered a glass of 2006 Pinot Nero Classici from St. Michael Eppan (183 CZK). It was light bodied, with low acidity. It was OK, but not great finish for the money. The full bottle goes for 915 CZK. I got a bottle of Mattoni (39 CZK) to go with it. 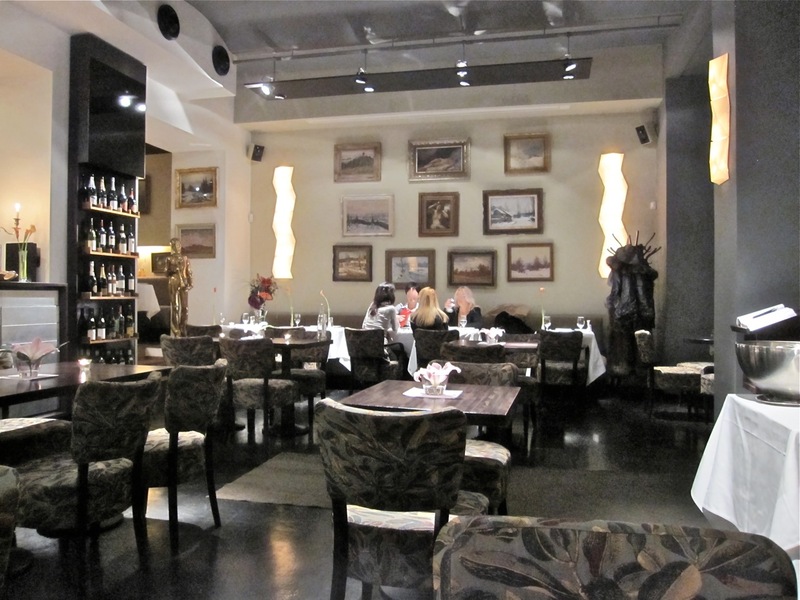 The international wine list is on the pricey side, with many bottles over 1000 CZK. 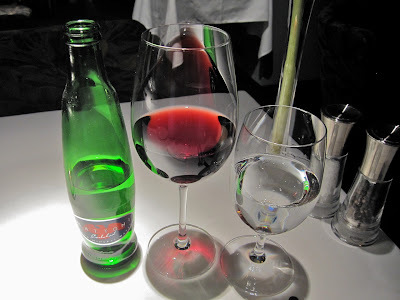 There were Czech wines for 300 to 500 CZK. 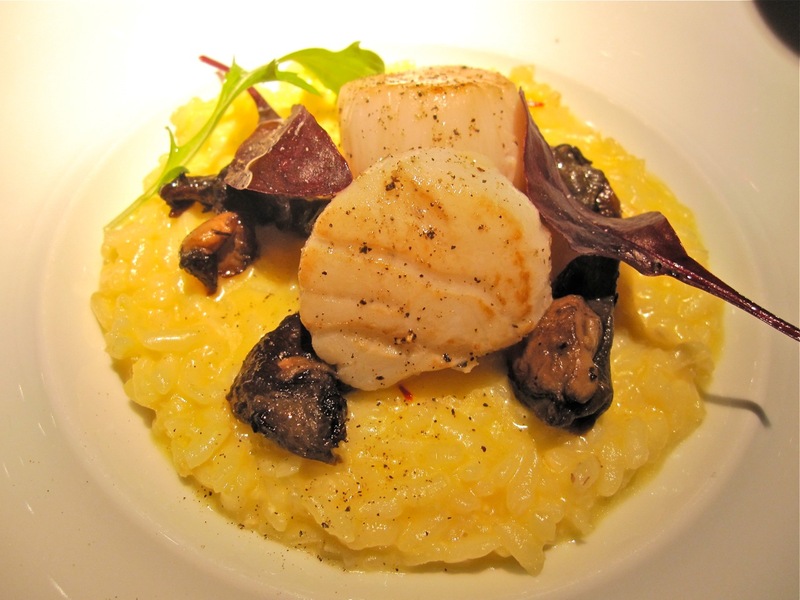 To start off, I ordered the Saffron risotto with grilled scallops and roasted porcini mushrooms (220 CZK). Where to begin? The al dente rice's yellow hue contrasted with the red threads from the saffron flower. But it wasn't just good looks. The risotto had a seductive, cheesy, lemony tang. The flavor of the saffron itself was much more subtle. On top were morsels of the most delicious, perfectly prepared porcini. The meaty, lightly salty mushrooms came hot from a pan and popped with flavor. Topping it off were two plump, fresh scallops that had been just lightly seared, allowing them to maintain their delicate, gelatinous texture. This dish was relatively small, but it meant a lot to me. I've thought of it often since we met. For a main course, I got a meal I have extensive experience with: the American flank steak (360 CZK). After I ordered, the waiter brought out a beautiful and very sharp Japanese steak knife from a special box. I've bought this juicy cut of American beef many times from Makro and I'm happy to tell you its provenance proved authentic. It was cooked perfectly medium rare with an excellent balance of salt and seasoning. The steak came with caramelized shallots, carrots and sauce Périgourdine. 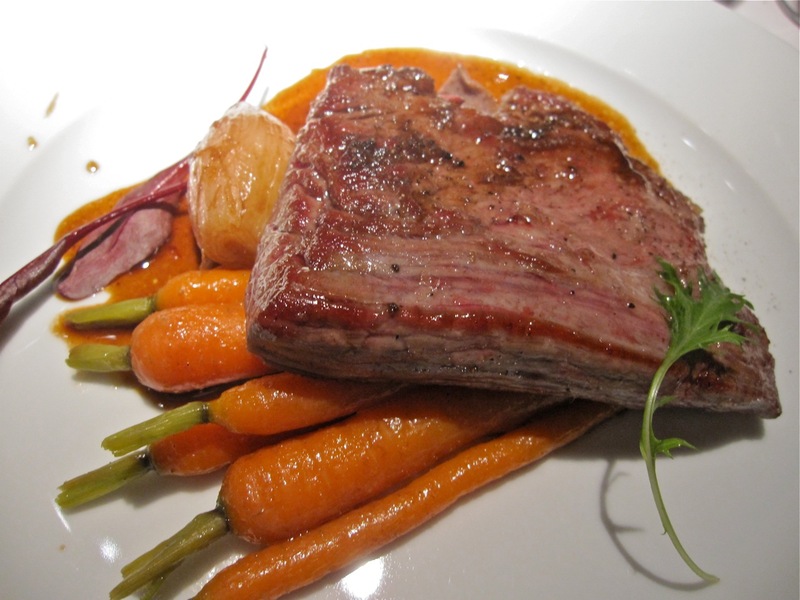 The cute carrots, tucked under the meat, were cooked to a great state between softness and crunch. The sweet shallots had the discernable flavor of orange. I was a little surprised at first, but it totally worked. The sauce was the best I can recollect in a long time. 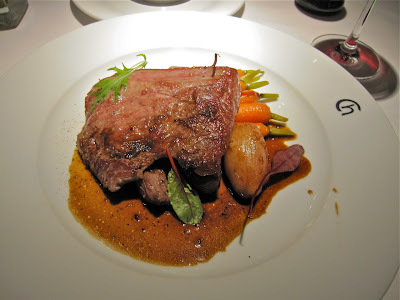 It had the rich, rendered drippings from the meat and a hint of peppery sweetness and wine for contrast. Périgourdine can mean it is made with truffles, but not always, and I didn't detect much mushroom flavor. Still, I mopped up every last drop. There was also an unadvertised side order of buttery, creamy mashed potatoes. They were very good, though I wouldn't rate them as highly as the great mashed potatoes I had at the defunct Maze by Gordon Ramsay or La Gare. For dessert, I valiantly resisted the urge to do on this visit what some readers complain I always do. So I did not order the chocolate fondant. 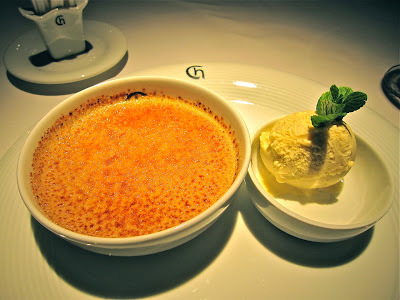 Instead, I got the green tea crème brûlée (140 CZK). The generous portion had the correct, hard burnt sugar shell on top. Breaking through revealed heavenly cream with the healthy hint of tea. I'm glad they resisted the urge to make it green. You don't need to see it. You just need to taste it. And you do. 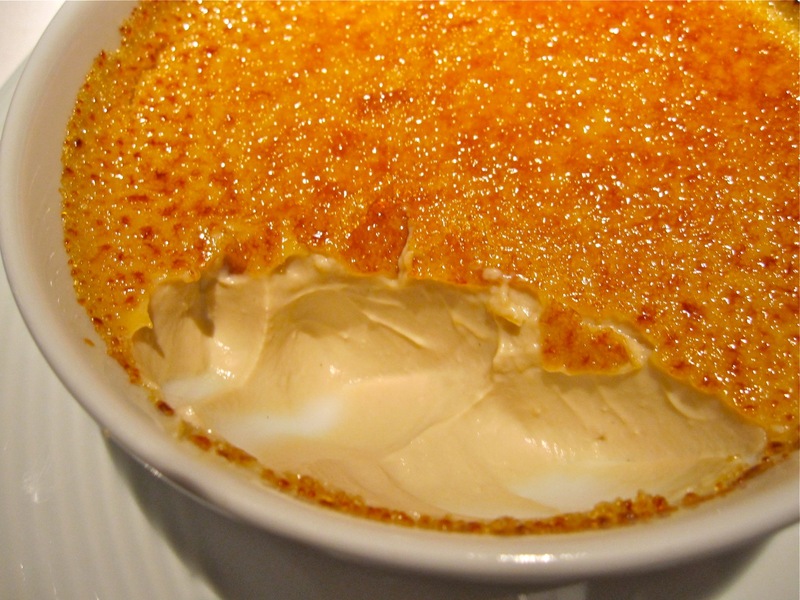 It's great when you get a classic dessert like this and they put just the right creative spin on it. It came with the absolutely first-class vanilla ice cream. This was the real deal, with natural coloring and flecked with bits of real vanilla bean. It briefly occurred to me that this cool and cold pairing was creamy overkill. "Wait, is that even possible?" I thought. It really comes down to your personal belief system. Ultimately, I had no problem with it. 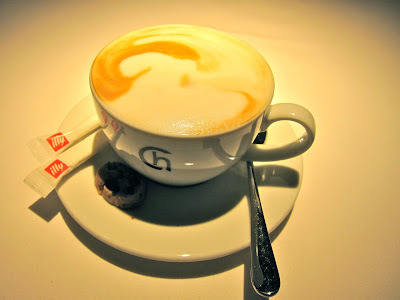 I finished with a fine, foamy cappuccino (55 CZK). The bill for this visit was 997 CZK before tip. I found the service to be efficient, but flat and terse. I got the sense the waiters were self-conscious about their English. Still, I managed to get a smile from a waiter with my compliments on the food as I was leaving. I enjoyed the meal very much and spent the week looking forward to my next visit. The following Friday, I sat on the opposite side of the dining room. There was a table of noisy diners in the back, and two tables taken in the front. Sinatra's greatest hits played in the background. I ordered the same wine again, just to be sure of my opinion with the first tasting. It remained unchanged. The restaurant offers smaller degustation portions of many of its offerings for lower prices. But I decided to go for the full measures again. 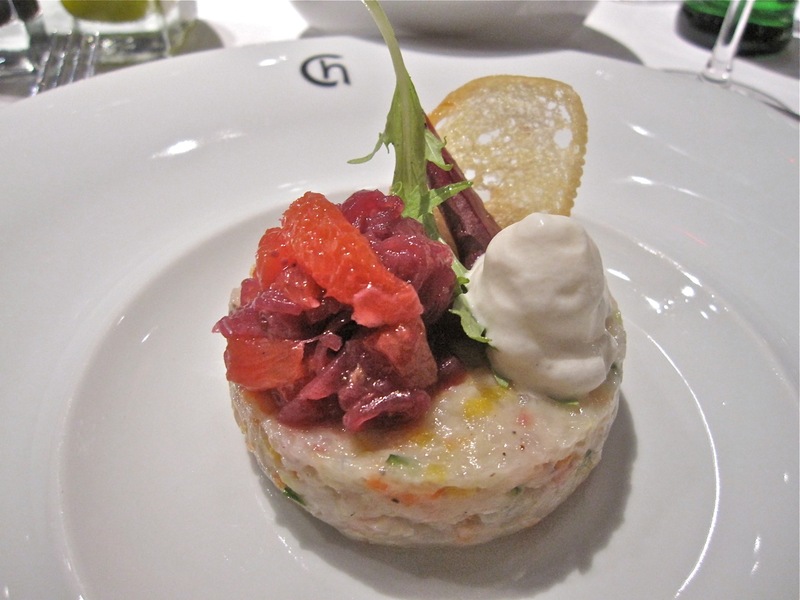 For a starter, I had the tartare of sea bass with fennel foam and salad of blood orange and red onion (260 CZK). The fresh fish was pristine, with a clean, clear flavor. It had a lightly crunchy texture due to the finely chopped carrot, cucumber and other veggies in the mix. I appreciated that it was something a different than the norm. The fennel foam had the hint of anise I was expecting. But my personal opinion is that the chef was too clever by half with this plate. The blood orange was lovely and the vinegary red onion added a sweet and sour note, but together, it was all too much. I'd have dropped at least one of them. It was easy enough to push the onion to the side. I still liked it a lot. Next up, I tried the cream of Jerusalem artichoke soup with Gorgonzola Dolce (95 CZK). It was frothy, creamy, with just a touch of vegetal sweetness. For the uninitiated, a Jerusalem artichoke is a type of flower and its root-like tubers are similar to potatoes. There was also white wine and shallots. The sweetness was balanced by the cheese. Gorgonzola Dolce is creamy and mild. Despite the name, it is not sweet. In fact, it was quite salty. The hot soup was comforting on a cold evening and I mopped up the bowl with the bread. 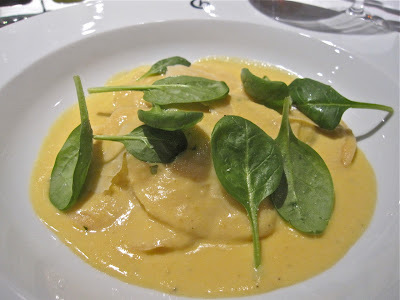 As a main course, I went for the ravioli-stuffed king crab with corn velouté (220 CZK). 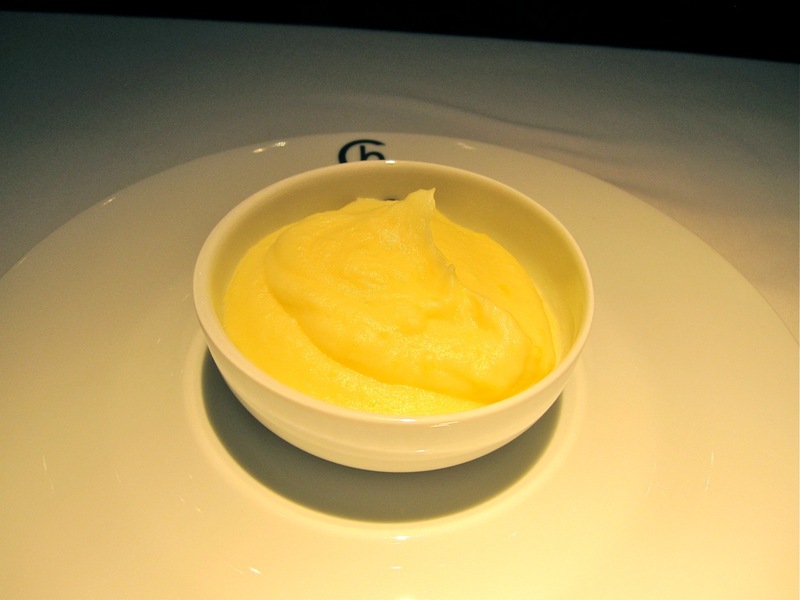 The velvety sauce, with its sweet corn sweetness, was as rich as a dessert. 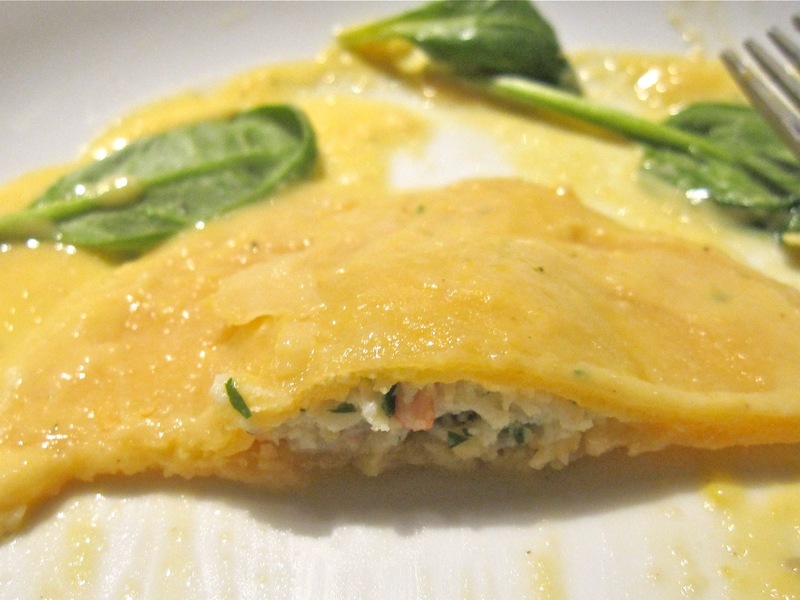 It was tempered by big shavings of Parmesan and fresh baby spinach leaves. I thought the combination was terrific and was quite happy that there was plenty of sauce. The filling was a rarity in Prague: generous portions of genuine crab meat. I accept no imitations. There was a problem with the dish that held it back from greatness. I do like my pasta al dente, but the homemade ravioli was undercooked. Crab-filled pasta pouches were just too floury and chewy. It wasn't worthy of being sent back, but it did bring my enthusiasm levels down a notch. However, the sauce absolved the sin fairly well. I still had room for dessert, and I could not resist temptation a second time. 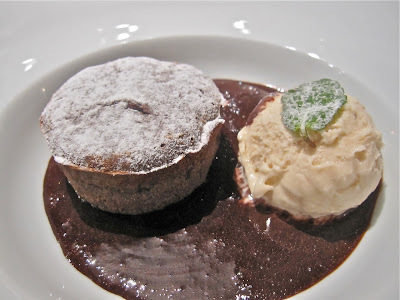 I went for the velouté chocolate fondant with dark chocolate and walnut ice cream (140 CZK). This hot, freshly baked cake sat upon a pool of dark chocolate. When broken open, molten dark chocolate of a different type spilled out and the chocolates mingled together. 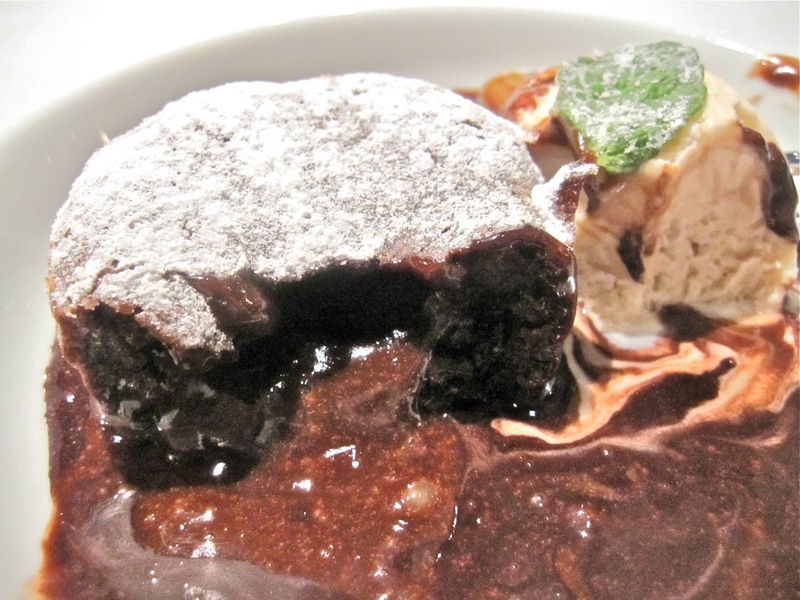 The delicious ice cream with real walnut chunks did its best to cool my chocolate passions. I wondered about a cocoa overdose. But again, I'm not sure if that's possible, especially with my high tolerance. The bill for this meal came to 898 CZK before tip. The service was equally efficient but a bit warmer this time. They were professional, but not too fussy. I felt comfortable there. The second meal didn't reach the heights of the first, but I'd still consider it one of the more enjoyable dinners I've had recently. A foodie I ran into after my meal told me she'd also tried Chagall's and agreed with my positive assessment. 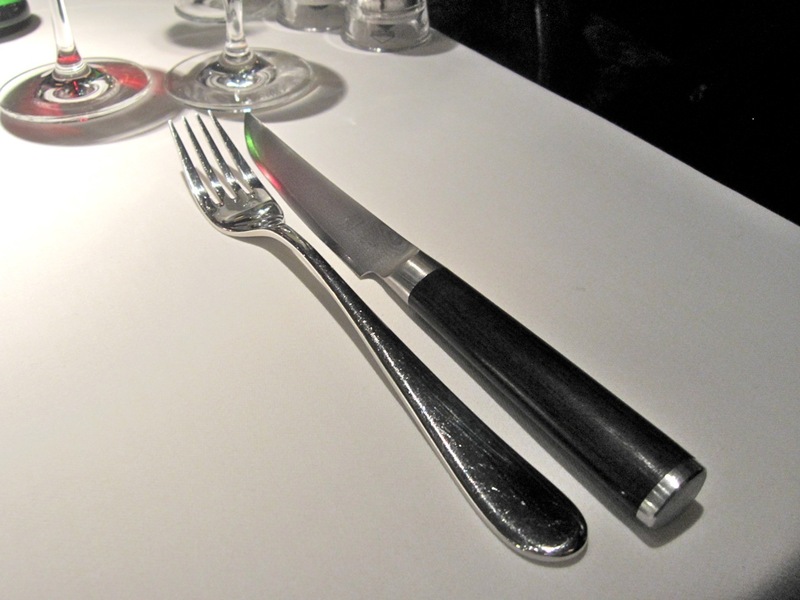 Given the level of cooking and the quality of the ingredients, the prices are reasonable, especially when compared with competing high-end establishments. I think it's worth the money. 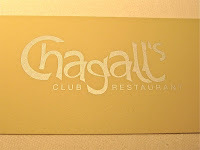 I've been recommending Chagall's to my friends, and I'll do the same here. I hate to raise expectations too high, but my feeling is that nearly everything works and they create from the heart. I say give it a try. Your review (thanks!) made me want badly to try the food. Love the decor as well. Great find! I'm so happy they took the TVs away after it changed from Cafe Wow (a stupid place) to Chagall's. 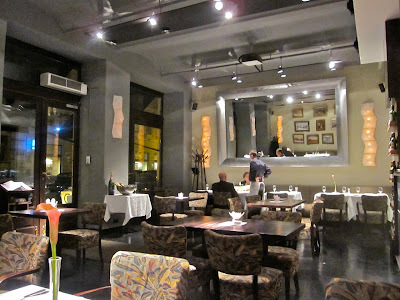 Very high-end food and service - a modern restaurant with a czech flair. 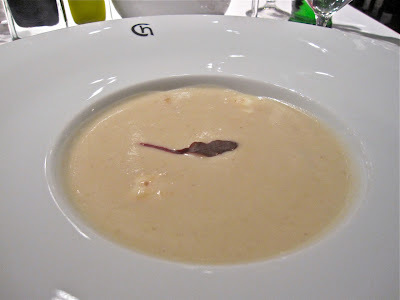 I loved the seasonal menu, Pumpkin Sage Soup was delish! 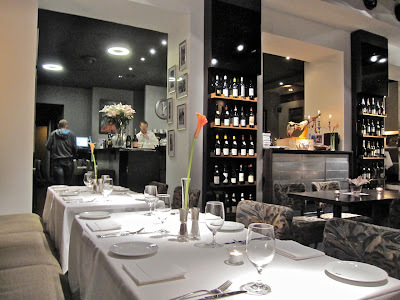 Very friendly staff, great decor, and the food was wonderful. Off the beaten trail, but a wonderful find.